As promised, here’s the video of the Zombie Walk. The vid makes it look far more nasty than it actually was! All four members of the C.A.V.E. 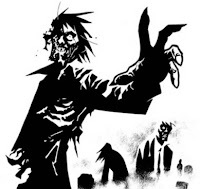 will be downtown tonight, shambling around as part of the first annual Zombie Walk (capitalized to increase importance). I spent the morning brewing up blood, and rubbing mud on my torn clothes. Zombies have it tough. Walking is very difficult for us, but to make matters worse, we survive on brains, which are notoriously difficult to get out of their containers. We keep organizing walks like the one tonight to raise awareness of our plight, but they keep getting mistaken for invasions. I’m sure we will podcast about it tomorrow. The next babbling to be done in our cave will cover games. In particular, some of our favorite gaming moments. The only problem is that Amber has no idea this is our topic. Maybe someone should tell her. Proof that belching may lead to flight, and possibly the urge to rip apart a smog monster. This week, we actually stay on topic, and offer up dual Top 5 lists of movie cliches. We also review Speed Racer on DVD, and introduce the only grading scale based on a fictitious fish. Just click the title above, and free fried flabble will be shipped to your doorstep. 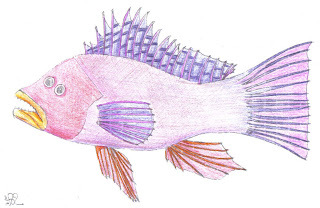 Following a rare live encounter with a seaflabble, Amber made this sketch of the beast. If for some reason you are unaware of the existence of seaflabble, listen to Episode 1 of our podcast. In our introductory mini-episode, we discuss the future of our podcast, how to quickly determine the population of any given country, and whether or not Stalker’s Corner is a viable segment idea. Click the title above, and enjoy the aroma of freshly-baked bread. Promise. As you wait for our first exciting podcast, wet your whistle with a little Ultraman.